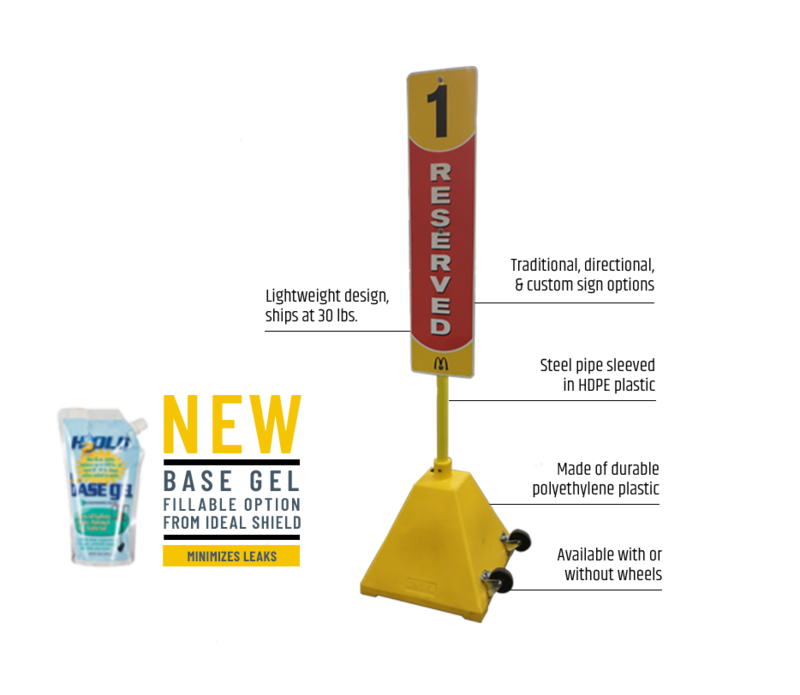 Ideal Shield’s Portable Pyramid Sign Bases are the perfect fit for Mobile Ordering and Curbside Pick Up services. Designed to withstand 75 mph winds when properly filled, our portable sign bases will help safeguard your parking lot and increase visibility for any and every building exterior. Available in both portable and permanent options, this cost-effective, heavy-duty product will make a lasting first impression. Following a quick and easy installation, our lightweight plastic sign base requires no maintenance. Compared to the regular 300 lbs concrete sign bases, our product weighs just 30 lbs, resulting in significantly reduced freight costs. When the bases are properly filled, the base can reach up to 175lbs. 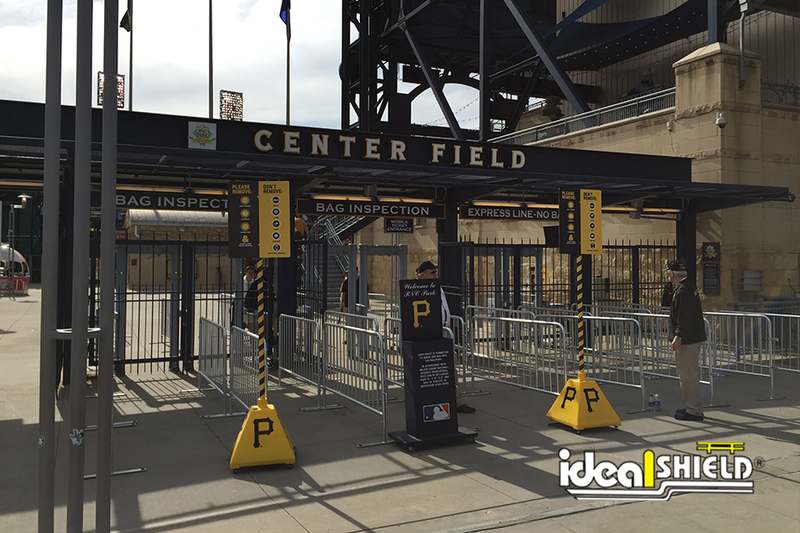 At a fraction of the cost, our durable plastic sign bases can withstand high wind speeds and daily wear and tear, offering an appealing, yet efficient, support structure for signposts. The lightweight design and added wheels option also make it easier for daily employees to move and maneuver the sign throughout the day. Custom logos and slogans are also available for the sign base. That includes customized company logos and branding, as well as standard logos, like handicap accessible logos and construction area logos, are available as well. We can also match any company colors on the base or signpost for branding purposes on large quantity orders. We’ve already matched over 600 different colors. Contact us to learn more about the possibilities. What colors are the Sign Bases available in? Standard Base Colors include OSHA Yellow, Red, Blue, and Black. We also offer Green, Brown, White, Orange, and Dark Gray upon request. Contact us for custom colors. How much is custom base colors? Starts at $125 for new colors or $50 for existing colors. Price can fluctuate depending on the exact color and how many need to be ordered. What colors are the Signposts available in? Standard signpost colors are Yellow, Red, Blue, Black, Brown, White, Light Gray, Dark Gray, and Silver. The base gel will freeze at temperatures below 32 degrees F (0 degrees C) and will return to a firm, stable gel as temperatures rise above 32 degrees F. To allow for base gel and water mixture to expand when frozen, only fill base with 16 gallons. The base gel’s performance will not be affected by repeated freeze-thaw cycles and lasts up to 7 years.